Even though many offices still use fax machines, you don't have to invest in one just to send a fax or even receive faxes. Instead, use one of these free services to send faxes from your computer to a fax machine over the internet or receive faxes to your email. You can also send faxes from your smartphone with the right apps. For fax sending, the services below allow you to enter in text to be faxed or upload a document (like a DOCX file from MS Word or a PDF file) that are already stored on your computer. You could also use a portable or desktop scanner to convert your paper files to digital documents for faxing. The free fax receiving services give you a fax number to hand out to others and will convert faxes sent to that number to a digital document delivered to your email address. Some of these services offer only limited free faxing. Read carefully before choosing one. Great for very limited faxing needs. Faxes straight from Word files. Inclusion of ads on the cover page. Send a fax for free anywhere in the US and Canada (or many international destinations). You can upload a document or PDF file or enter text to fax. The free service places an ad on the cover page and is limited to a maximum of 3 pages per fax, up to 5 free faxes per day. If you need to send more than 3 pages, you can send a fax of up to 25 pages with priority delivery and no ad on the cover page for $1.99. The service is accredited with the Better Business Bureau. Very limited number of free faxes. 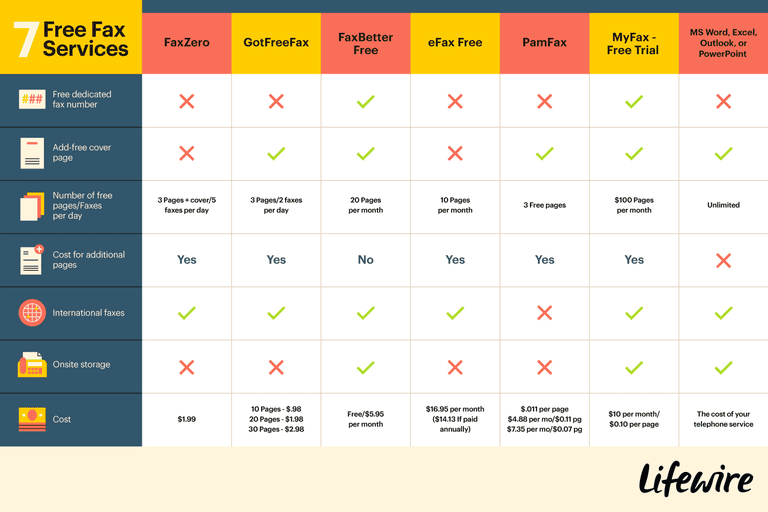 If you'd rather not have an ad on the cover page, consider GotFreeFax, which uses no-ad free fax cover pages and also doesn't add any GotFreeFax branding to your fax. You can send faxes online to anywhere in the U.S. and Canada. You can send up to 3 pages per fax with 2 free faxes allowed per day. If you need to send more than 3 pages, GotFreeFax allows you to fax up to 10 pages for $0.98, 20 pages for $1.98, and 30 pages for $2.98. The premium pay-per-fax service also uses an encrypted connection and provides priority delivery. Great for people with consistent but low-volume fax needs. Weekly fax receipts to keep your number. FaxBetter Free offers you a dedicated toll free fax number for receiving up to 20 pages per month, plus email notifications every time you receive a fax. The catch is that cannot send faxes using free fax number, and the fax-to-email service as well as the OCR/searchable fax feature is only a 30-day trial. FaxBetter Free stores up to 1,000 pages on its site for you to access your faxes online. If you don't expect to receive faxes as regularly and/or would like the fax-to-email, to send faxes, have searchable faxes, and up to 500 pages per month options, the FaxBetter account starts at $5.95 per month. Tied to the eFax software. The eFax Free plan gives you a free fax number for incoming faxes which are delivered to you by email. You'll need the eFax document viewing software and will be limited to 10 incoming faxes a month, but if you have light fax receiving needs, eFax Free is a helpful service. To change the area code for your fax number, receive more than 10 incoming faxes, or send as well as receive faxes, you'll need to upgrade to the eFax Plus plan, which is a bit more costly than average, starting at $16.95 per month plus a one-time setup fee of $10. Limited number of free pages. Pamfax is free to join, and new users get three free fax pages. Support for Dropbox, Box.net and Google Documents is built into the service. If you decide to upgrade, PamFax will provide you with your own personal fax number. PamFax is available for the internet, Microsoft Windows, Mac OS X, iPhone/iPad, Android and Blackberry 10. Once you're beyond your three free fax pages, you'll can choose between On Demand ($0.11 per page), and Professional ($7.02 per month and $0.07 per page) or Basic Plans ($4.66 per month and $0.11 per page). Both the Basic and Professional plans include a personal fax number and allow you to send multiple documents in a single fax. What's nice about this fax service is that you can even use PamFax with Skype. Subscription plan good for people with moderate-to-heavy fax needs. Free trial means you'll be charged if you forget to cancel. MyFax Free supports fax sending to over 40 countries and supports many more types of files than other fax services: Word, Excel, PowerPoint, and image files. There are also apps for your or smartphone. Unfortunately, MyFax changed its free account to a free trial. So, you have 30 days in which you can send and receive faxes for free. After that time, accounts start at $10 per month. Before you sign up for the free trial, be sure to read the company's Terms & Conditions. Requires a modem and phone line. One of the most overlooked features in man Microsoft Office programs is the ability to send a fax. The Microsoft Office suite includes a feature that allows you to send internet faxes via Outlook, Word, Excel, or PowerPoint. This feature relies on having the Windows Fax Printer Driver or Fax Services installed on the computer you want to send faxes from. If your edition of Windows includes the driver or service, you must install it before you can send Internet faxes. If it doesn't, you'll need that download above. Specific directions depend on which version of Windows you are using, but if you need to send a fax to someone and you would rather not sign up for one of the above-mentioned free online services, this could be a viable option.